Barndiva is a restaurant, cocktail lounge and wine bar. We are open to the public Wednesday through Sunday for lunch, brunch and dinner. Parties of up to five guests can reserve online. For parties of five or more, or to be added to our wait list for any reservation you cannot make online at this time, we ask you to call the restaurant directly at 707 . 431 . 0100. We are able to accommodate a range of extraordinary private parties at Barndiva and Studio Barndiva and their adjoining gardens. Groups of 25 or more kindly contact Barndiva’s events department 707 . 771 . 9481. There are many noble reasons to serve sustainably sourced food, but the best reason remains the simplest. It tastes better. A great meal should have elements of both celebration and tradition, old world techniques filtered through a distinctly modern sensibility. You can’t “Eat the View” without knowing who has grown it, or raised the animals grazing and free ranging upon it. As orchard farmers for three decades we came into the Barndiva project eyes wide open, knowing just how challenging it would be to build a restaurant around sustainably grown vegetables and healthy animals. And how important. We are honored to be living and working in the Sonoma and Mendocino foodshed. That’s where the celebration begins. Want to learn more? Butcher a pig with us, tour farms with us, play around in our kitchens or get creative with cocktails. 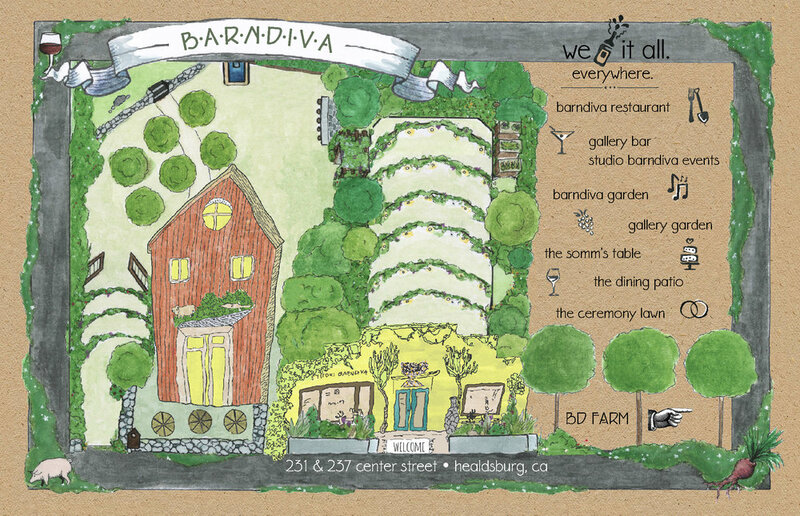 Follow us @barndivahealdsburg or search our blog library for insights, tips, inspiration and a culinary wake up call.